NBC and ABC on Thursday night framed stories around concerns of “abortion rights” advocates who want proof Supreme Court nominee Sonia Sotomayor is on their side, but both cloaked their pieces around the proposition “both sides” of the debate are equally worried. Thursday's CBS Evening News, after a Wednesday story on how a political label cannot be applied to Sotomayer, didn't mention her. LESTER HOLT: The White House said today President Obama is very comfortable that Supreme Court nominee Judge Sonia Sotomayor shares his interpretation of the constitution. But spokesman Robert Gibbs says the President did not specifically ask her about the right to privacy, a key issue in the abortion debate. PETE WILLIAMS: Ever since the Supreme Court decided Roe versus Wade 36 years ago, a nominee's view on abortion has been the dominant issue, but with this nominee, it's a mystery. Both sides on the abortion issue agree on this, they're eager to know exactly what Sonia Sotomayor thinks about abortion and the constitution. NANCY NORTHRUP, ABORTION RIGHTS ADVOCATE: It is important that we not have a guessing game when we're talking about a justice who's going to take a seat on a court that was 5-4 in its last abortion decisions. AN CRAWFORD GREENBERG: In this battle over Sotomayor's nomination, there appears to be unusual common ground on one of the nation's most divisive issues. 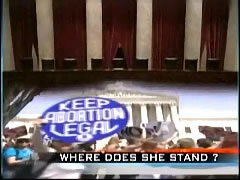 On abortion, both sides in the contentious debate want to know more. NANCY NORTHRUP, CENTER FOR REPRODUCTIVE RIGHTS: We simply don't know where Judge Sotomayor is on core constitutional protections in Roe versus Wade. CHARMAINE YOEST, AMERICANS UNITED FOR LIFE: We need to know what her philosophy is and how she would approach a case if it came before her. Press Secretary Robert Gibbs said Obama didn't discuss specific cases with Sotomayor, but was satisfied with her views on individual rights. GIBBS: He left very comfortable with her interpretation of the constitution being similar to that of his. 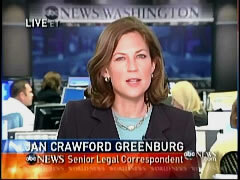 GREENBURG: But Sotomayor's record on abortion has yet to bear that out.